We’d love your help. Let us know what’s wrong with this preview of PUSH by Jurgen Matthesius. Do you ever feel as if, despite your spirituality and faith, something significant is missing? Most teenagers and college students, as well as tens of millions of adults, are still striving to This revolutionary book will explain what God wants for and from us when we petition Him for his will to manifest “on Earth as it is in Heaven,” and how to understand the difference. I had trouble connecting with this book and the author's message. I felt there was a lot of useful information and the author is obviously very knowledgeable. But I felt the first few chapters were like an infomercial. It seemed to keep saying "stick around for this!" or "but wait, there's more!" That eventually stopped. Then the repetition began. I understand wanting to get a point across, but it became clear after a few times. Then I started thinking "Is there something I'm not understanding?" I had trouble connecting with this book and the author's message. I felt there was a lot of useful information and the author is obviously very knowledgeable. But I felt the first few chapters were like an infomercial. It seemed to keep saying "stick around for this!" or "but wait, there's more!" That eventually stopped. Then the repetition began. I understand wanting to get a point across, but it became clear after a few times. Then I started thinking "Is there something I'm not understanding?" Because points were just repeated in different ways (I'm guilty of doing this when I was in college because I wanted to meet the length requirements for the papers I was writing). I felt the author sometimes strayed from the topic too, which was sometimes confusing. It was all interesting. But I also didn't always agree with his beliefs. It was minor things, like the speaking in tongues for example. Love this book! It is a fresh and exciting look at prayer. I felt like the Holy Spirit was talking to me. I keep re-reading parts then stopping to pray. It made me look at some things differently and my prayer life is much stronger. A great book that will definitely refresh your prayer life! I borrowed this book from a friend. She bought it when we visited his church C3 San Diego. Jurgen is a wonderful speaker. You can literally see the love for God and the people at his church just bubbling out of him. His book was no different. His voice comes across just as clear as if he was on the platform. Reading this came at the right time. I've been struggling with my prayer life. When I finally read this book, I was laying on the floor in my apartment just bawling and calling out to God. If I borrowed this book from a friend. She bought it when we visited his church C3 San Diego. His book was no different. His voice comes across just as clear as if he was on the platform. Reading this came at the right time. I've been struggling with my prayer life. When I finally read this book, I was laying on the floor in my apartment just bawling and calling out to God. If this book does anything, it shows me why prayer is so important: so God's will is done on earth as it is in Heaven. This is a fantastic book. It teaches on prayer in a very effective pratical way that will increase God's sway and blessing in your life. Every believer should read it. I am going to recommend it to my pastor. This book was nothing short of incredible. It is EXACTLY what I needed right now. It IS a bit on the repetitious side, but the personal stories the author relates are great. Well, some of them seem kind of unbelievable, but isn't that what faith is about? Believing what you can't see, smell, touch or feel, but trusting that God is there and loves you very much? Though the book wasn't about God's love. Nothing so simple as that. Basically, Satan has already lost. He was kicked out of heaven, into This book was nothing short of incredible. It is EXACTLY what I needed right now. Basically, Satan has already lost. He was kicked out of heaven, into time, putting an expiration date on how long he can fight before he's dumped into hell. He's already lost, BUT that doesn't mean he has given up TRYING. His goal is to hurt God and the only way he can do that is to turn God's creation, His love, US away from Him and to Satan. We are a pawn in Satan's battle with God. But we aren't powerless. Satan has power, true, but God has power AND AUTHORITY and He has given that power and authority to us. We can access that power and authority through Jesus Christ in prayer. And boy, do we and the world need it. Just look at all of the evil happening day in, day out. That isn't God's perfect will for us, but it falls under His permissible will. Contrary to the belief of many, God is not the author of ills or evil. Yes He is all powerful, but He allows it. Why? Because He gave every single human being on this planet FREE WILL. Which means, even though God CAN control us, He has told us that He WON'T. We aren't puppets. We are free to choose Him, or not Him. And when we choose not Him, we by default choose the other one. Which makes Satan happy and saddens God. So we pray. We pray to push back the darkness and to bring God's kingdom to earth. We don't pray passively. We pray with authority and power and belief through Christ AND we have to act in the same way, acting out God's will of peace and love. Faith without acts is dead. We can't just pray, "God save us" and then sit back and expect Him to do all of the heavy lifting. God works THROUGH us, through anything and anyone He chooses. So act. God could be working through you and you don't even know it! But He can only do that if we ACT as well as pray. This author is a prayer warrior. I'm just a baby, taking my first steps on my faith journey it feels. I do NOT feel half as able as this author was and is, to hear and obey God. But this book was more encouraging then depressing. The author doesn't come off as "holier than thou". He's not rubbing his awesomeness in the face of the reader. He's sharing his life experiences so others can grow in faith and start praying with belief, conviction and authority through Christ. I really needed this book now. I have been struggling for years with how to pray, what to pray, WHY to pray when it doesn't seem to DO anything. I mean, who hasn't prayer for world peace? And has it happened yet? But this book shows that just praying isn't the answer, PUSH prayer and action are. I am so thankful for this book. It's scary. It acknowledges that evil DOES exist and that we ALL have targets on our backs, but with God, through prayer, we can help fight the darkness and have God's protection from the evils of the world. It's not magic and it's not perfect. I could be the best prayer warrior in the world, but I can still get killed by a driver distracted by their cell phone. The free will of every single person can affect more than just themselves. So it's not a magical protection against life. Jesus said that there will be tribulations and trials, but we have something many people don't have, we have Him. And that makes all the difference. Sorry, didn't mean to get all preachy there. But this book really touched me and hit all of the things I was searching for regarding the topic of prayer. It is a keeper and a re-read and I recommend it to everyone. Recommends it for: everyone who wants to know God in the 21st Century. I have been given a copy of this book from NetGalley so that I could read it and give my honest review. I've always believe in God, just not organized religion. I have read plenty of religious and spiritual books. As I was reading this one (intuition told me to pick this), I could actually feel electricity all over me. I KNEW that GOD and Jesus were talking through Mr. Matthesius.Jugen writes like he is talking to an old friend. He is comfortable writing for us everyday people and not some academ I have been given a copy of this book from NetGalley so that I could read it and give my honest review. I've always believe in God, just not organized religion. I have read plenty of religious and spiritual books. As I was reading this one (intuition told me to pick this), I could actually feel electricity all over me. I KNEW that GOD and Jesus were talking through Mr. Matthesius.Jugen writes like he is talking to an old friend. He is comfortable writing for us everyday people and not some academic journal. He is very relatable. His message is that if you expect God to help you, you have got to PUSH, as in moving something heavy. You have to give God everything you've got. You can't be an armchair quarterback, then expect to play in the NFL You have to pray, and not just when things seem bleak. Jurgen gives many examples by way of passages in the bible (don't roll your eyes). He does it in a clear, 21st century way that is so different from anyone else. Most of all, he is passionate about it. He lifts us up and gives us wings. He concludes with praising God, not complaining. BELIEVE YOU ALREADY HAVE IT AND IT IS YOURS: through absolute faith and trust in our Lord. There is no room for doubt. I so wanted to rate this book five stars, but couldn't because the author vacillates a bit too much. This is my first introduction to Jurgen Matthesius and I assure you it won't be my last. 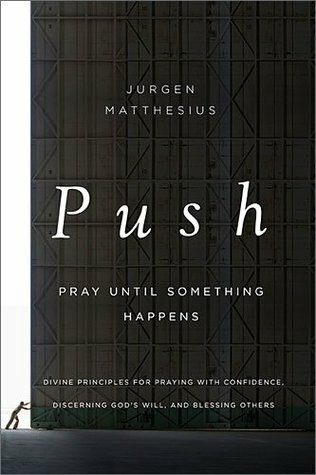 PUSH, when concentrating on the scriptural principles of prayer, is perhaps the best reference I have found so far. The Principles are clearly explained and the author references many, many scriptures to back up his contentions. This book will be referred to by me many times in the future and therefore kept i I so wanted to rate this book five stars, but couldn't because the author vacillates a bit too much. This is my first introduction to Jurgen Matthesius and I assure you it won't be my last. PUSH, when concentrating on the scriptural principles of prayer, is perhaps the best reference I have found so far. The Principles are clearly explained and the author references many, many scriptures to back up his contentions. This book will be referred to by me many times in the future and therefore kept in my reference library-not too many make it there. All that being said, its very evident that PUSH was written by a pastor. Although hidden in the style of the book more so than most other books by Pastors; some chapters and stories in the book appear to be sermons reinvented for the book. However, that is a criticism the author shares with many in the genre. Even some of the market big boys such as Osteen get accused of this. Great book, really taught me a lot and allowed me to know more of God. The author has some good stories and ideas but he can be very repetitive. He seems to think listing every imaginable argument for his views strengthens his argument but if he condensed the book by weeding out weaker arguments it would be more convincing and a better read. The author made me feel that if I had an unanswered prayer, it was because I didn't pray hard enough. Very legalistic.